Six local militants were killed in a night-long operation in south Kashmir’s Anantnag district. Among those dead was Azad Ahmad Malik, a suspect in the killing of the Editor of Rising Kashmir Shujaat Bukhari earlier in 2018. The six militants were hiding in a jungle in Sekipora at Bijbehara, Anantnag. The killings sparked a wave of protests and clashes in south Kashmir with security forces being pelted with stones. Hundreds of locals participated in the funeral of the militants. The Ministry of External Affairs (MEA) summoned the Deputy High Commissioner of Pakistan after an Indian consular team was prevented from meeting pilgrims visiting Nankana Sahib, where a Sikh festival is now being celebrated. The Indian side conveyed disappointment that the consular team could not meet the pilgrims for performing official duties, despite prior permission from the Ministry of Foreign Affairs (MoFA) of Pakistan. A team of local Sikhs, led by their pro-Khalistan leader Gopal Chawla, prevented the Indian officials from entering the holy sites. It was conveyed that the opposition to the presence of the Indian officials came more from the fundamentalists, and that Pakistani officials did not play a direct role in the incidents. The discussion came hours before Pakistan announced that Prime Minister Imran Khan will inaugurate the Kartarpur Corridor for the 550th birth anniversary of Guru Nanak in 2019. India also raised the issue of alleged radicalisation of Sikhs in Pakistan with Deputy High Commissioner Shah. He was reminded that India allowed Pakistani diplomats to meet the pilgrims from across the border visiting Kalyar Sharif. Piran Kaliyar is the dargah of 13th-century Sufi saint of Chishti Order, Alauddin Ali Ahmed Sabir Kalyari, situated at Kaliyar village, near Haridwar in Uttarakhand on the banks of Ganga Canal. Three heavily armed suicide bombers stormed the Chinese consulate in Pakistan’s largest city of Karachi, killing four persons, including two policemen, before being shot dead by security forces that foiled the daring attack in the high-security zone, the police said. 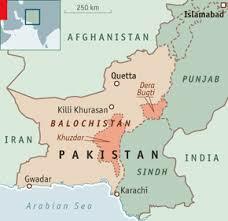 The attack was soon claimed by the outlawed Baloch Liberation Army (BLA), which said it would not tolerate “any Chinese military expansionist endeavours on Baloch soil”. 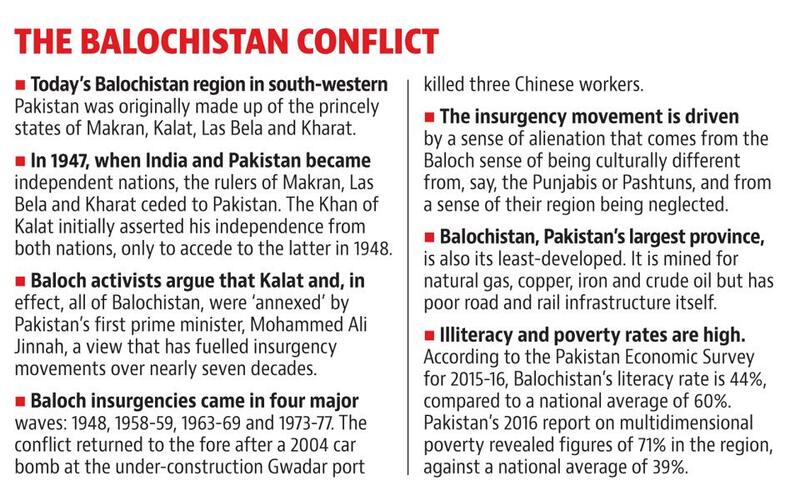 The resource-rich Balochistan is at the heart of the ambitious China-Pakistan Economic Corridor (CPEC). The suspected suicide bombers were killed before they could enter the consulate in the posh Clifton area, Karachi police chief Amir Shaikh said. Three major science administrators in India — the Council of Scientific and Industrial Research (CSIR), the Indian Council for Medical Research (ICMR) and the Department of Biotechnolgy — are getting together to promote research in herbal drugs, some of which involve deriving new drugs from marijuana. Among the first such studies likely to kick off is joint investigation by the CSIR-Indian Institute of Integrative Medicine and the Tata Memorial Centre, Mumbai. The U.S. FDA, in 2018, approved Epidiolex (cannabidiol) [CBD] oral solution for the treatment of seizures associated with two rare and severe forms of epilepsy, Lennox-Gastaut syndrome and Dravet syndrome. Marijuana (or hemp), more formally parts of the cannabis super-family, is illegal for commercial cultivation though it grows as weed in several parts of the country. Uttarakhand, Jammu and — as of this month Uttar Pradesh — have allowed restricted cultivation of the plant for medical research. One of the trials, said a doctor associated with the study, was to check if the “feelings of bliss” induced by cannabis could be detected at the cellular level. “The effects of bhaang (marijuana consumed orally) have been known to induce a state of bliss. What we’d like to find out if those effects in the brain travel all the way into the cancerous cell and can change its profile,” said a researcher involved. The studies into the therapeutic potential of marijuana is part of a larger governmental thrust to making new drugs derived from herbs and plants that find mention in Ayurvedic and other traditional-medicine knowledge systems. “Special leave petitions filed in cases where death sentence is awarded by the courts below, should not be dismissed without giving reasons, at least qua death sentence,” a three-judge Bench of Justices A.K. Sikri, Ashok Bhushan and Indira Banerjee observed in a recent judgment. “The Bench’s decision came in a review petition filed by Babasheb Maruti Kamble who was condemned to the gallows for murder. The Chandrayaan-2 lunar lander’s sensors are set to undergo a crucial test in the next few days as the mission races towards a planned take-off in January 2019. The Indian Space Research Organisation (ISRO) plans to fly the sensors on an aircraft over its artificial lunar site to see how they will function and guide the Chandrayaan-2 landing craft when it starts descending on the lunar terrain. The test on ground, called the Lander Sensor Performance Test or LSPT, will be conducted at ISRO’s new R&D campus having an artificial lunar site at Challakere in Chitradurga district, about 200 km from Bengaluru, ISRO Chairman K. Sivan said. The test flight is slated tentatively for November 24. The orbiter carrying the lander and a rover is scheduled to be sent to the Moon from Sriharikota on January 31 and is expected to reach there sometime in February 2019. 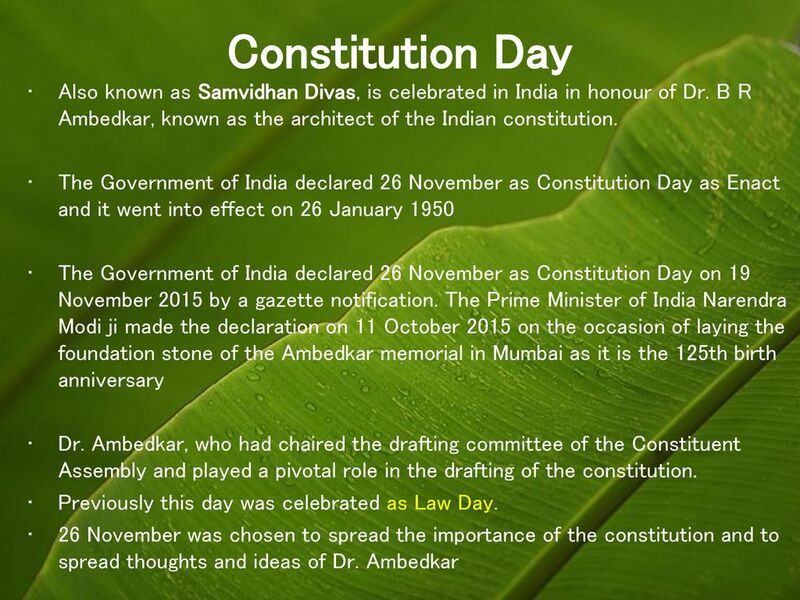 The Constitution will be made available in Braille for the first time ahead of the Constitution Day on November 26. In a joint project undertaken by The Buddhist Association for the Blind along with Saavi Foundation and Swagat Thorat, who started India’s first Braille newsletter Sparshdnyan, the Constitution will be made available in five parts in Braille for the benefit of visually challenged individuals. The Centre has denied a Right to Information (RTI) request for a copy of the Right to Information (Amendment) Bill 2018, which had been notified for introduction in the monsoon session of Parliament. The Bill sought to give the Centre power to set the tenure and salaries of State and Central Information Commissioners. Critics worry this could threaten the independence of Commissioners. An RTI request for details on the applicants and search committee set up to fill the vacancies on the Central Information Commission (CIC) has also been denied. The CIC is the final appellate authority for all Central public authorities. By December 1, 2018 there will be 8 vacancies in the 11-member Commission. In an affidavit filed in an ongoing Supreme Court case regarding the appointment of Information Commissioners, the Centre admitted that it has held up appointments due to its effort to first amend the law. In its rejoinder, the National Campaign for People’s Right to Information (NCPRI) plans to argue that this rationale does not provide “a legal ground for not filling vacancies in the Central Information Commission” as the existing Act already provides sufficient details on salaries and tenure. “We are seeing a complete lack of transparency in the appointment process for the top transparency watchdog,” Ms. Bhardwaj said. A Class X and XII Gujarat State Secondary and Higher Secondary Board (GSSHSEB) Examination application form is apparently asking only Muslim students to specify their religion in the exam form. The form asks the students belonging to religious minorities to specify their religion, but the option has only ‘Muslim’ or ‘other’. Other religious minorities in Gujarat include Jains, Sikhs, Buddhists, Christians, Parsis and Jews. J. Shah, Chairman, GSSHSEB, told mediapersons that the Board had not changed the format of the exam form since 2013, and there was no complaint either from any student or any parent regarding the issue. The United States is trying to coax wireless companies and internet providers in allied countries to shun Chinese telecoms giant Huawei, citing cyber security risks, The Wall Street Journal reported. The lobbying campaign, also targeting government officials, is taking place in allied countries where Huawei equipment is widely used such as Germany, Italy and Japan, WSJ stated. One U.S. worry is over the use of Chinese telecom equipment in countries with US military bases, such as Germany, Italy and Japan, the newspaper said. The U.S. is also mulling more financial aid for telecom development in countries that avoid using Chinese-made equipment, as per the Journal. Huawei – one of the world’s largest telecommunications equipment and services providers – has been under scrutiny in some countries, including the United States and Australia, over its alleged close links to Beijing. The Finance Ministry would not curtail its capital infusion plan for this financial year even as state-owned banks would be needing lesser funds following the Reserve Bank’s decision to defer the deadline to meet Basel III norms by a year, according to sources. Under the new dispensation, the capital infusion by the government in public sector banks (PSBs) for meeting the capital buffer norms would come down to around Rs. 15,000-20,000 crore, sources said. However, there will not be any reduction in the capital funding plan as announced in October 2017despite a lower requirement due to the RBI extending the deadline for meeting the Capital Consevation Buffer (CCB) of 2.5%, under Basel-III norms, until March 2020, sources said. The extension could reduce the burden of PSBs by Rs. 35,000 crore this fiscal, according to rating agency Crisil. After assessing the requirement of each bank, the ministry is expected to finalise capital infusion of about Rs. 54,000 crore by November 2018 or by the first half of December 2018. 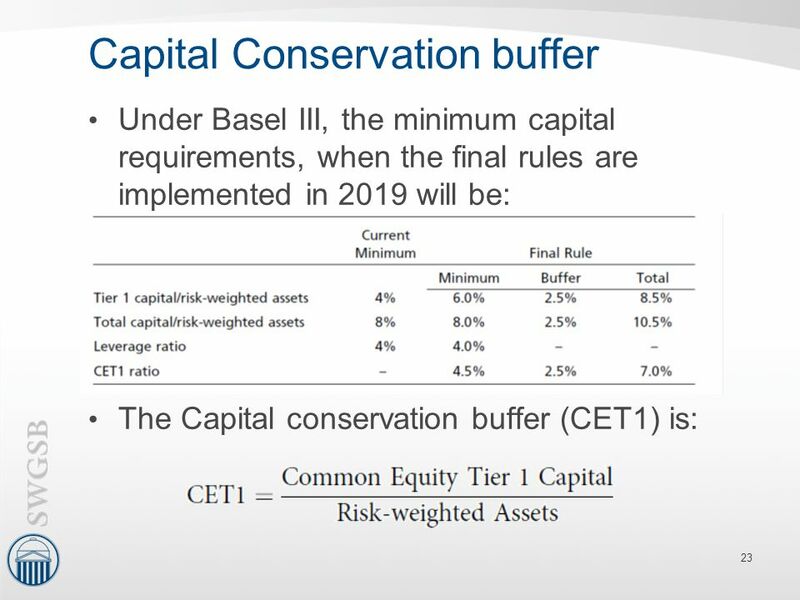 The CCB is currently at 1.875% and the remaining 0.625% was to be met by March 2019. Generally, there is a leverage of 10 times on the capital, sources said, adding that the lending capacity would increase by Rs. 3.5 lakh crore.